working towards a "zero carbon" impact on the earth's resources through sustainable community energy projects and conservation measures. 09.11.17 The story so far..... Neighbourhood Planning came about as a result of the Localism Act 2011. Its intent is to give more power and a bigger voice to the people who live in the community regarding planning. Once a Neighbourhood Plan is complete it passes through an inspection process to ensure it is compliant with national planning policy, after which a public referendum is held, if supported by residents the plan is then 'made', it becomes a legal policy document that must be taken into consideration by the planning authority for all planning applications in the area (with the exception of Mineral Extraction applications). In 2014 the Parish Council held its first public meeting to inform residents and to invite them to participate. Unfortunately, early meetings were not well attended and it was some time before it was decided that there was enough interest for Upton by Chester to have a Neighbourhood Development Plan. In parished areas, the Parish Council is the authority that facilitates and leads neighbourhood planning. However, it is a community project and residents are vital to the process. 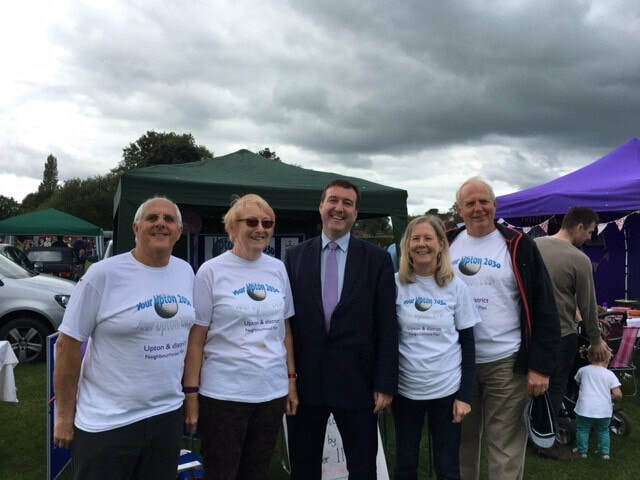 A steering group was set up made up from elected councillors and Upton by Chester residents. For a couple of years tentative steps were taken to set out the main requirements of the plan and begin a consultation program to support it. Last year, after a re-think about our priorities, a change of membership within the steering group and some renewed vigour the plan began to make good progress. We have now carried out some solid consultation involving many sectors of our community and have set up a working group to begin to write policies. The Parish Council Clerk looks after the funding for this project and we have twice been successful when applying for grant funding; the Parish Council is also committed to supporting the plan financially. 27.09.17 Members of the Steering Group warmly welcomed visitors to the meeting. Business owners from Weston Grove shops were invited to attend the meeting to discuss current and future provision of shops. An interesting conversation took place regarding the economic issues being faced and what may be needed to ensure that the Weston Grove shops grow and thrive. Due to the unavoidable absence of several members of the Steering Group the meeting was not quorate and therefore no formal decisions could be made. A change of date for the next meeting was proposed - to change to Monday 23rd October (from 24th) and will be confirmed shortly. 05.06.17 NEXT MEETING - The next meeting of the NDP Steering Group will be held on July 25th (there will be no meeting in June). Working party meetings will be taking place to work on consultation and communication and also to consider the policies that will be included in the plan - unfortunately this meeting was cancelled, however, a working party continued to work informally on planning and policies. 30.05.17 The latest meeting of the NDP Steering Group took place this evening; steady progress is being made with regards to consultation with the Upton community and businesses. New members of the steering group are busy looking into ways to communicate further and will personally visit all Upton business premises to conduct the survey. A sub-group has now been formed to commence policy writing. If you are interested in joining in with the work of this group - especially with communication/marketing and consultation, please contact the clerk to the Parish Council. 15.03.17 We had a very successful community presentation evening on 27th February. Thank you to all those who attended and offered so much useful advice and opinion. The steering group will gather all the information together a summary of which will be available here shortly. 08.03.17 ​After a period when progress was slow, the steering group for the NDP, comprising councillors and local residents, is working hard to get across the vision we have developed for ‘Our Upton 2030’. 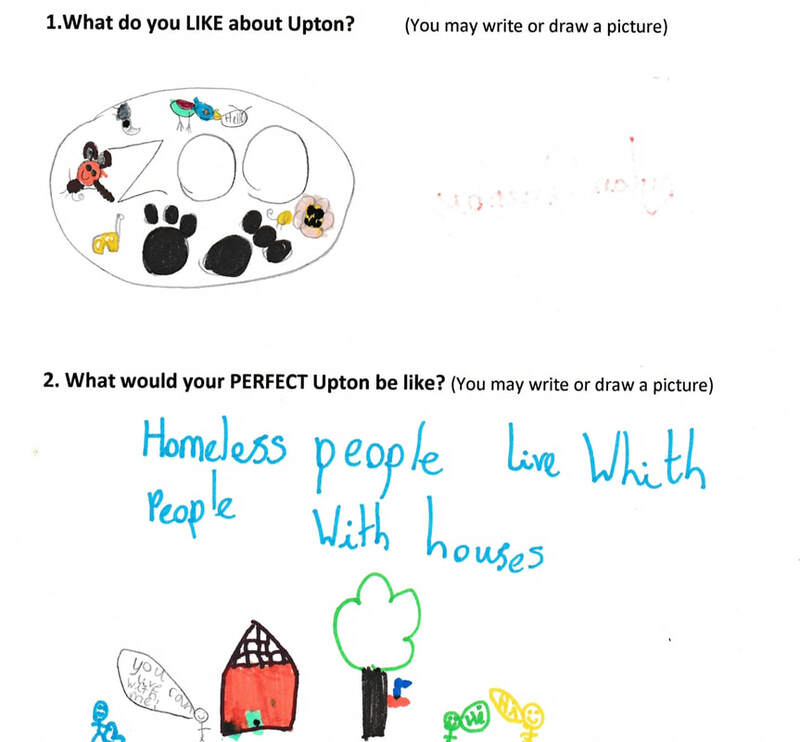 A video is being completed, which gives a brief history of Upton over the years and which will be used to help all of us to focus on the way sin which we want Upton to develop and also the ways in which we do not want it to change. Our vision statement is available on the website and also at the Pavilion and the Library. We describe it as ‘a pleasant, predominantly residential area, that provides a secure and sustainable environment for its inhabitants’ and is both part of the wider urban area of Chester but with a distinctive character as a former village settlement, protected by Green Belt, with local access to open spaces and countryside’ and would like you to have a look at the whole vision when you are able to. Local groups were invited to an evening at the Pavilion in February, where a video will be shown and participants will be able to give their views on the major aspects the Neighbourhood Plan needs to address: housing for our area, the future of the major employers and their land: the Zoo, the Dale Camp and the Hospital. The plan is our chance to ensure that what happens in Upton as far as planning is concerned, is what we feel Upton needs rather than what is thrust upon us from outside. If your group was not invited or was unable to attend please feel free to contact us via the clerk, to find out more or to make comments.